Software Updates | Pinnacle Systems Inc. Older Pinnacle Products that do not have a USB plug, require software changes via a physical CPU swap out (both Master & Slave chips). This can be swapped in the field. Let the factory know the version of software you already have (written on a white label on top of the replaceable CPU chips). If you product was purchased prior to 2012, chances are that it is NOT a USB enabled product. If you purchased after Mid 2015 the Baud rate shown below has changed to 115200 from 230400 for all products. You will need to standard USB printer cable and a laptop computer. Unzip the file (CP210x_Windows_Drivers.zip) and Install this driver on the computer you will be using for the update. Click here to download the free transfer program call TERMINAL. Unzip the file (Terminal.zip) and place the Terminal.exe file on your desktop. No installation is needed. You will need to let the Factory know the letter / number that first appears when you originally hit the “Space Bar”. Any Software Emailed will work only with this product. 4) The menu should redisplay 1 time after the *’s are done, otherwise the firmware has failed to upload correctly. This video describes the procedure to update firmware/software in a Pinnacle Systems Microguard. Even though the video specifically goes over the Microguard MG unit, this applies to the MG DUAL controller, DR controller, and Universal Safety Hub Controller. 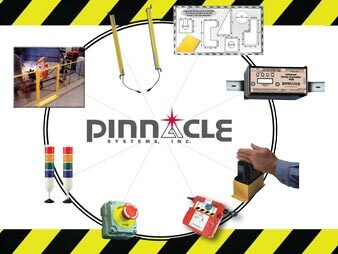 For additional Software questions, please email service@pinnaclesystems.com.